During a recent trip up to Massachusetts, Dan and I stopped at a place called the Book Mill. It is an old mill converted into a book and music store, cafe and performance space. It is full of creaky charm, overlooks a rushing stream and is filled with MA’s most literary hipsters and often, although we didn’t see them the day we were there, the area’s royal couple, Thurston Moore and Kim Gordon. 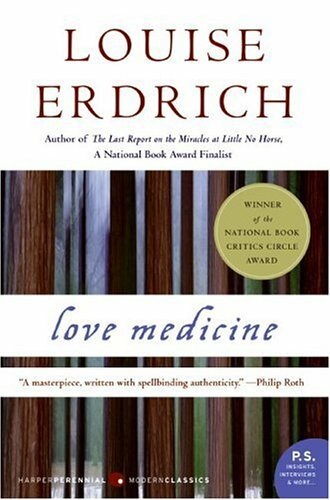 It took me a little while to decide what I should purchase there; finally I landed on a book I’d been meaning to read for years, Love Medicine by Louise Erdrich. I’d read her later work, Plague of Doves, and loved the writing but had some issues with the structure, so giving her most well-known work a shot seemed like a natural move. The copy I picked up at the Book Mill is the “new and expanded edition”–after reading it, I am happy I have this longer version because I could have kept reading this book forever.